Alema Nasim and her students at iEARN Pakistan discuss some of the 3D printing projects they will do in Global Inventors. 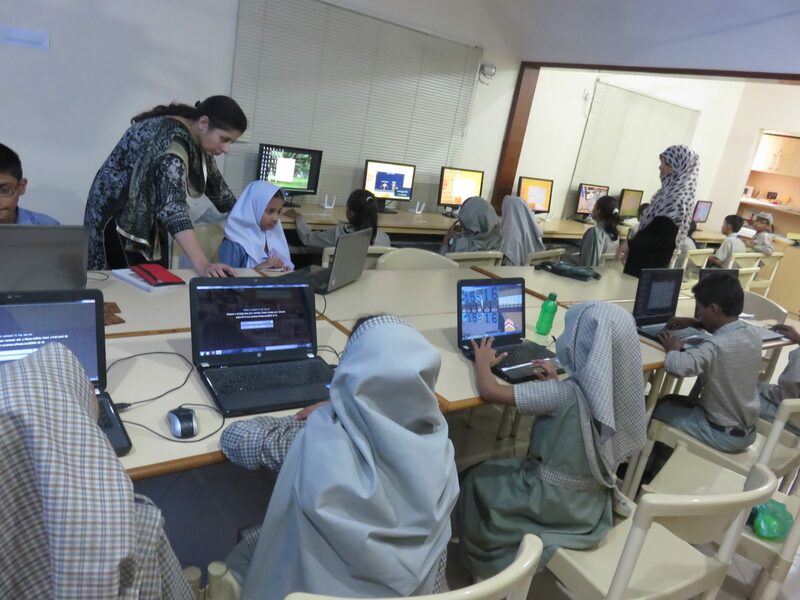 Alema Nasim, who works as Manager Professional Development at iEARN Pakistan says one of her favorite Level Up Village courses is Global Inventors. 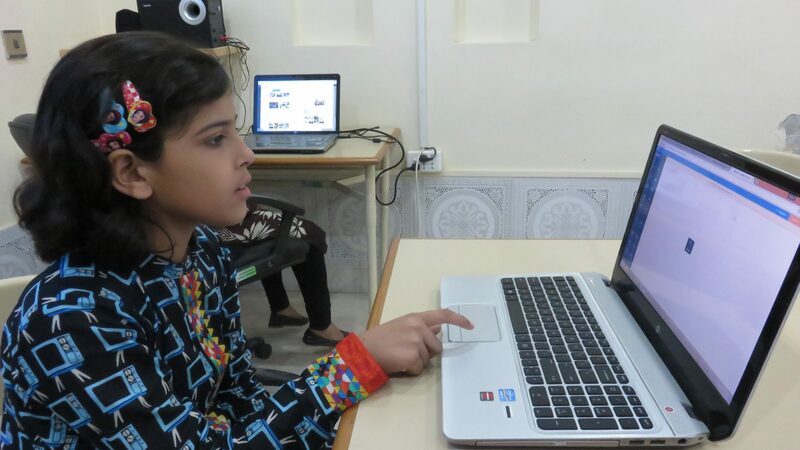 Students in Pakistan design websites, code video games, learn CAD & 3D printing, and more in their Level Up Village courses – all in collaboration with partner students in the United States. Alema says her students are also very enthusiastic about Level Up Village’s new Global Web Designers course, which teaches them the basics of web designing and coding. Meanwhile, the global component of all Level Up Village courses has helped broaden her students’ view of the world, since every LUV course includes project collaboration and the exchange of video messages with partner students in the United States. “The students’ responses in this meaningful global exchange program clearly show that it has brought them closer, removed the misconceptions and generalizations among them and given them confidence,” said Alema. In the past three years, hundreds of students have participated in Level Up Village courses through iEARN Pakistan. iEARN is just one several programs run by Society for International Education (SIE), a non-profit that provides offers membership to schools that are interested in integrating 21st century technologies. “SIE works for the capacity building of learning communities based on effective use of ICT in education, language learning, teacher development and youth leadership in Pakistan,” said Alema. 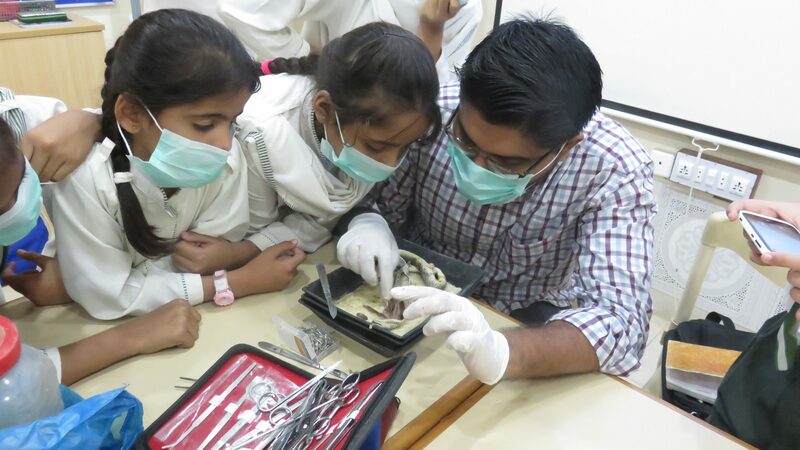 In Global Doctors: Anatomy, students at iEARN Pakistan dissected a variety of animal specimens in order to learn more about human body systems. SIE offers various programs in the areas of youth leadership, technology, media & animation, English language proficiency, journalism and foreign exchange. As participants in the Adobe Youth Voices (AYV) media program, SIE students create short videos to raise awareness about social issues that don’t often get widespread attention. “One group of students who participated in this program addressed the the issue of skin color discrimination and the obsession with fairer skin. Their video, which then won the AYV Video Award, was about girls having dark skin and not able to get married due to this color barrier,” said Alema. Through these various initiatives, SIE hopes to not only give students a voice, but also enrich the education and technology skills of students who may not otherwise have these opportunities. SIE offers various programs in the areas of youth leadership, technology, media & animation, English language proficiency, journalism and foreign exchange.